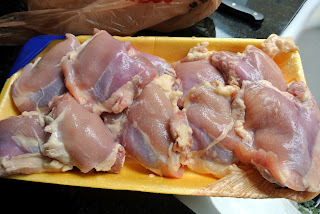 Bone in Chicken was on sale this week for $0.99 cents a pound at my local Albertson's. So I made this huge meal for next to nothing! 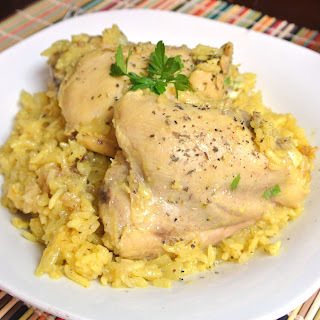 I found this recipe to be outstanding. With subtle spices, it gives it almost a middle eastern flair. Leaving the bone in the chicken keeps it moist and tender. Because you are going to need your strainer for this recipe....I have a question for all of you... How do you clean your strainer, or sieve? The only way I have found to clean mine is by finding a bowl or pan larger than the strainer. I fill the pan with hot soapy water. 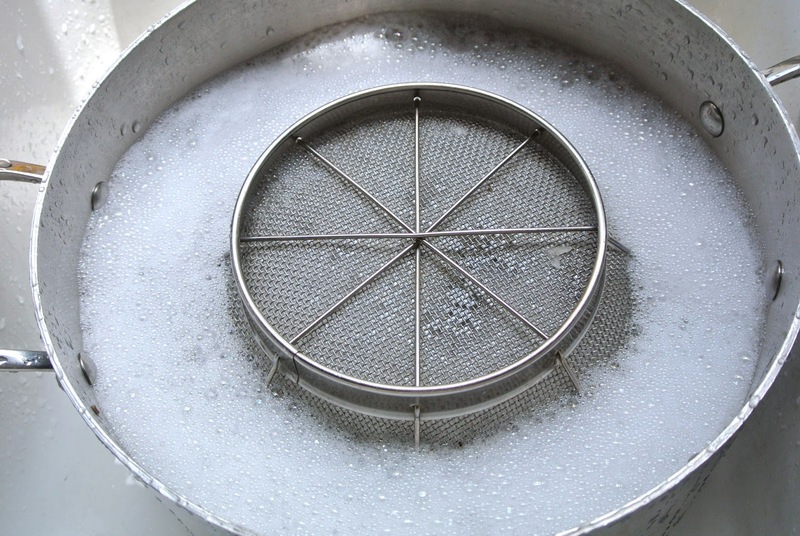 Then I dump it and rinse the strainer fully. There has to be a better way, but I can't find one. As I sure you have all experienced...the dishwasher is not an option. All it does is act like the crumb collector in the dishwasher. I am open to all suggestions. Peel off skin of the Chicken thighs and rinse. Pat dry and season chicken with salt and pepper. Return to fridge for 20 minutes. 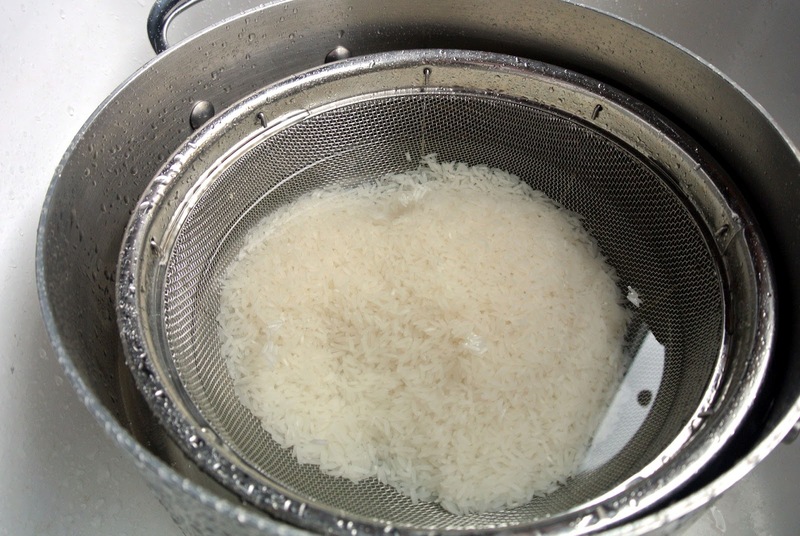 Place rice in a large sieve and place inside a large pot. Fill bowl with cold water running water. Drain. Repeat about 10 times. 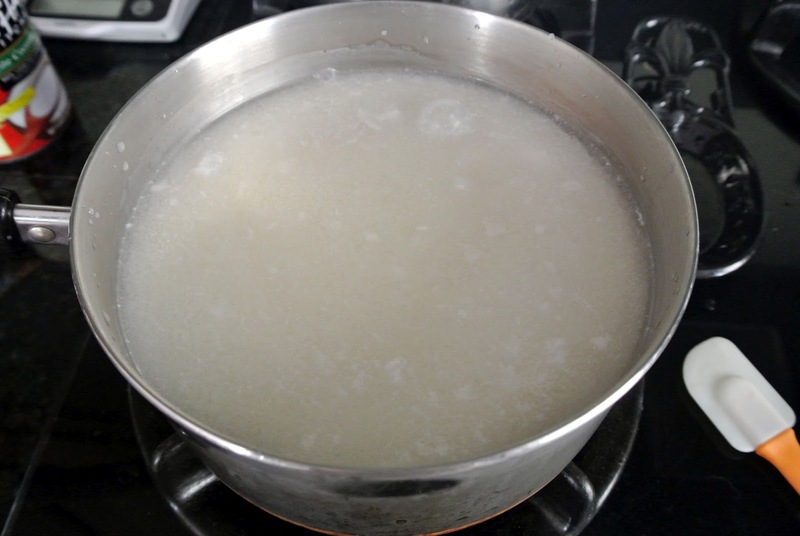 Pour off rinse water and cover rice with lukewarm tap water. Cover rice and let it soak for 20 minutes. Drain rice through a sieve. Heat stock and coconut milk in a saucepan over moderately high heat until boiling. 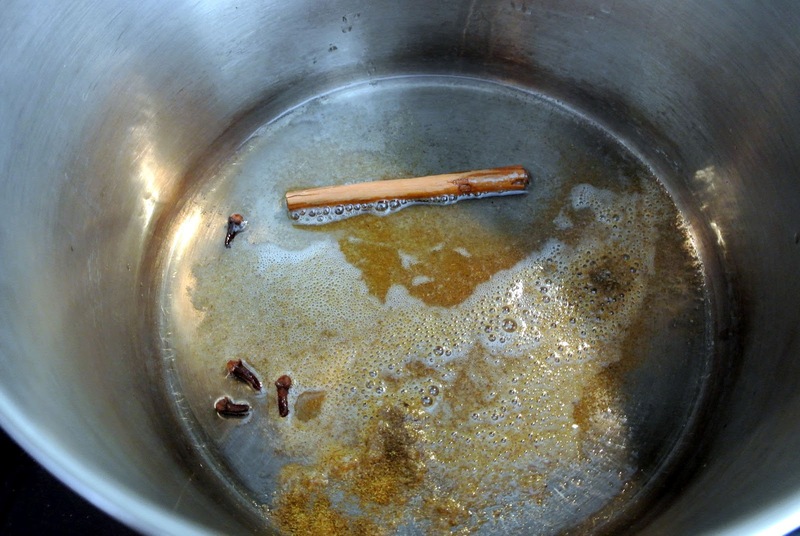 Heat oil in a large pot set over moderate heat until warmed through. Add cumin, cinnamon and cloves. Cook for about 1 minute, or until the spices are fragrant. Add onion and cook, stirring, until softened, about 3 minutes. 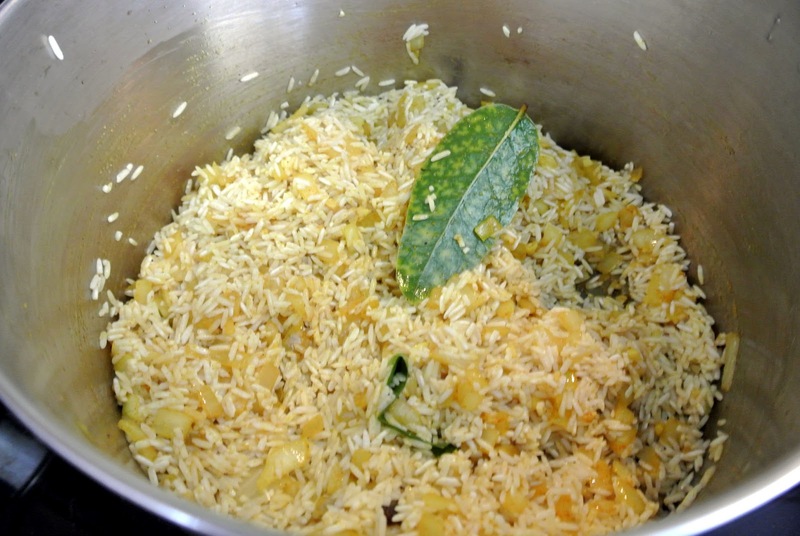 Add ginger, garlic, coriander, turmeric and the bay leaves and drained rice, stirring to coat rice with oil. Add seasoned chicken and cook on high heat for 3 minutes. 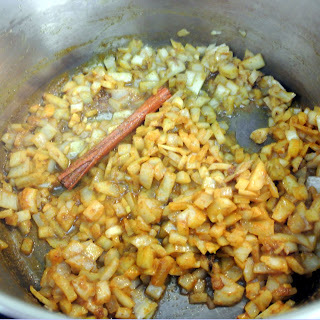 Add hot stock mixture and bring back up to a boil. 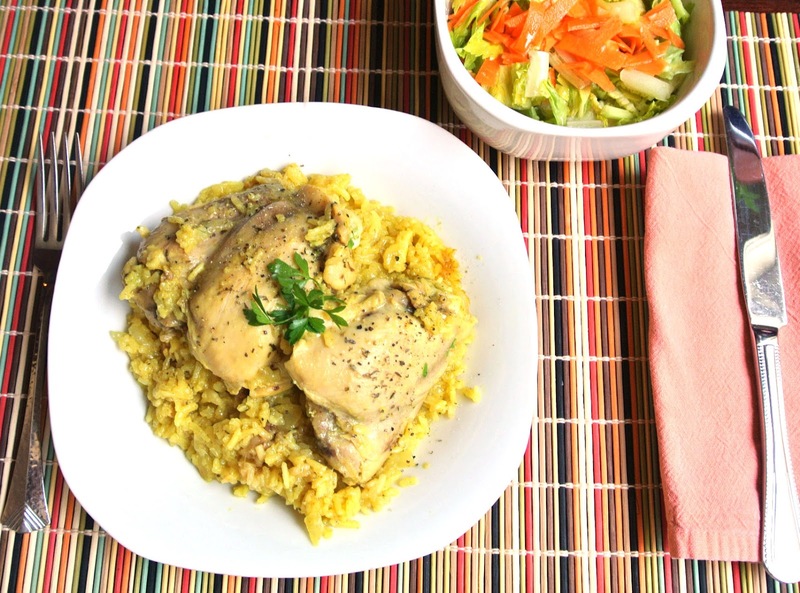 Season with salt and freshly grated pepper. 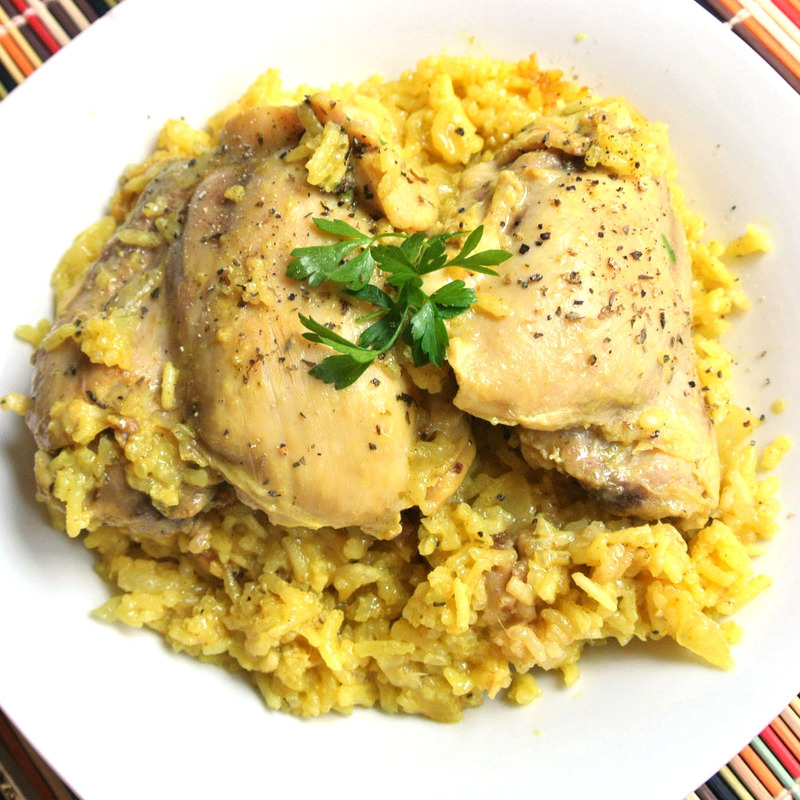 Cover and cook over moderate heat until liquid is absorbed absorbed and chicken cooked through, about 15 minutes. Gently fold in parsley. Remove from heat. Cover pot and let pilaf sit for 30 minutes before serving. Fluff with a fork and serve. Oh this looks like a perfectly lovely recipe; can't wait to try it. Happy 4th to you and yours! My wife will love this dish! I am so excited to try this recipe! It looks so delicious! 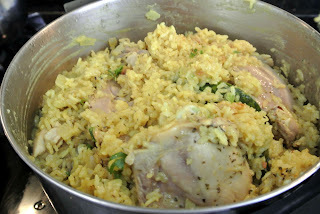 I think I've actually got all the ingredients, too, so... dinner for tomorrow it is! Thank you so much for sharing this with us :-) Hope you and your family have a great weekend!